Is this the cable I'd need to connect the gscartsw to framemeister? The Euro scart adapter looks like the above. It lets you plug in a euro scart connection. So if you want to use the adapter you already purchased you want a male scart to male scart cable to go from the Gscartsw to Framemeister. You could also get the cable you linked but it would bypass the adapter you purchased and plug in directly. Since you've already got an adapter, you can just get a SCART to SCART cable. But that cable you linked to will also work, you just won't need to use the adapter you have. What you do not want is a JP21 cable. These look identical to SCART, but have a different pinout and you can break your equipment if you use it. There's a good episode of My Life in Gaming that covers it if you are curious. Hey Superg; I'm having some issues with my RGB modded NES, hopefully you could clarify this for me. My NES RGB was working fine through the switch until I had the mod re-done with Borti's IGR I/O board (https://github.com/borti4938/NESRGB-IGR ... ter/NES-IO). Now I get no picture at all through the switch, but if I plug direct into my PVM it works with no problems. What do you think could be causing this? Is there any reason the I/O board should be incompatible with the switch, or could it be something wrong with the sync that is being output? You have to check what sync it outputs and what cable is used. If it's TTL, it should be attenuated either in cable or on board. Usually it's board / cable incompatibility. Thanks for the quick response. The cable I have is Csync and the modder told me he wired the system for Csync as well. That plus the fact that it works with no problems if I plug in direct to my PVM has me a bit confused...I feel like it should definitely work in the switch but not sure what other factor it could be. TTL refers to the level (voltage) of the sync signal. C-sync can still be a TTL-level sync signal. PVMs will typically accept a huge variety of voltages without issue, but the switch and scalers tend to be pickier about it and you could potentially damage them by running things hotter than you should. Is there a time frame for pre-orders of the gcompsw now that the other project is coming along? Like, are we looking at first or second quarter of next year or do you not even know that much yet about the product's future? No info on that until I complete gscartsw firmware. Thanks for the info. The cable I'm using is the stock Retro-access SNES cable with 75 OHM(https://retro-access.com/collections/sc ... nded-cable). I think this means the cable is actually not TTL, but I'm not sure tbh.. I'm about to send this console out to have someone look at it, but I'm wondering if just buying a different cable would fix the issue? If I'm understanding this correctly, it seems the mod and cable are not exactly matching specs, which is not a problem for a PVM, but it is a problem for the GSCART. So if I can just get the right cable I wouldn't need to have anything changed on the console itself. The first thing that product page mentions is that it contains a resistor to bring down the CSync voltage of the stock SNES. The SNES outputs TTL sync (And no, not everyone is going to know that), so this cable is appropriate for bringing down TTL sync to 75Ohm applications, like SCART. With that in mind, in order to work with that cable, your NES RGB mod needs to be outputting TTL sync, like a stock SNES would. Update: I'm getting a good progress on the firmware. Still not done but now we have one issue less. Right now, the switch SD part is 100% tested and functional, sync regeneration, automatic switching, everything that was available in gscartsw_lite is implemented and tested. SoG mode: detection and forwarding is implemented and tested. SoG->RGBS conversion still needs some work, two main issues, OSSC sometimes drops HD mode for a moment and there is some light horizontal sync jitter involved. @superg thanks for the update. Speaking for myself, but happy for you to take whatever time is necessary and not feel like you have to rush it. The part I'm not fully understanding is that the cable does work if I go direct..but it just doesn't work with the GSCART. Based on what superg said, that leads me to think mod and cable are not matching. That would mean my NES is not outputting TTL, but rather 75 OHM already. In that case I think a straight pass through cable should theoretically get me picture through the switch...going to give that a try and will update with the results. If you're not even remotely handy with a soldering iron (the fix is a simple bridge or unbridge of a jumper), then yeah, I think getting a straight cable will be the simplest option for you. Personally, if I had my NES modded with an NESRGB and a Nintendo AV Multi-out, I'd prefer it act like an SNES and output TTL, so I can use regular SNES cables. Oh I agree 100 %, that was my preference. But yeah, no soldering experience whatsoever so it's a lot easier for me to just get a new cable. AFAIK aside from not being able to use regular SNES cables there should be no other downsides and it should play nice with my switch now, hopefully. This, we should keep it as standard as possible. I keep my Famicom Jr outputting TTL level sync just to be able to use standard SCART cable. Why is that? Are there problems from using a pass thru cable? If you are using an NESRGB that is setup under the impression that you will be using a pass through cable, then no problems. However, if your NESRGB is expecting you to be using a standard SNES cable, then yes, you will have problems using a pass through cable, especially with the sync. Hence why superg and others (myself included) feel it is best to configure the NESRGB under the assumption that a standard SNES cable will be used since that provides the closest thing to a standard output for Nintendo systems. You've then got a single cable that can be used with NES, SNES, and N64 (well, and Game Cube, though not if you mod it with GC Dual). For reference, the cable you are using is setup as a standard SNES cable, meaning it will have resistors and/or capacitors on the video and sync lines. To that end, you need to make sure the NESRGB is configured for that cable. This is easy to verify without doing any soldering, at least if you are using a toploader since disassembly is incredibly easy. On the NESRGB itself, you need to make sure that the jumper J8 is open, not soldered closed. Ideally, there are three capacitors on the board that also should be removed, but leaving them on will not cause any problems other than a darker signal (at least I think that is what happens, but I know you will not break anything). You can see those capacitors here: https://www.youtube.com/watch?v=CvmSTbPKvoA. They are located right by J8, actually. So I recently got a PVM and I'm using a scart to BNC cable to hook it up. I have a few component devices, and my PVM supports component. Would it be possible to send the YPbPr signal through the gSCARTsw and have it be recognized, switched to, and sent on? It's just sync on Luma right? Am I insane to even be trying this? In theory the gscartsw version superg is currently working on will detect YPbPr and pass it through unmolested. Past gscartsw versions will not detect YPbPr. Thanks for the info, sounds promising. I won't get my hopes up too high but sounds like there's a chance. I just put in a pre-order for the gscartsw, but I need some help when it comes to audio. I plan to output sound via PC speakers. Does the new version have RCA inputs and headphone jack output? And if not, what do you think I need to be able to connect it? 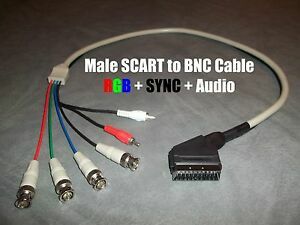 It's wookieewin's Male SCART to BNC with Audio breakouts. Any clarification is much appreciated. Alternatively, if you've one of the SCART outputs from the gscartsw going to an OSSC, then the audio-out from that device works even if you've got it powered off (so the OSSC can act as your breakout box in effect). That's what I do. Thanks a lot for the helpful tips. Luckily I have the OSSC, so I'll try that. You'd just use the RCA leads on your SCART cable. Assuming your PC speakers require a 3.5 TRS plug, you can get either a female stereo RCA to female 3.5mm TRS adapter and a male-to-male 3.5mm TRS cable, or you can get a female stereo RCA to male 3.5mm TRS cable. Any chance we'll ever get a GScart with 10 inputs? 8 inputs unfortunately is not enough for my setup and buying two would be too expensive. I cannot speak for superg. But I sincerely doubt a ten input gscartsw will ever happen. I suggest you guy one gscartsw and daisy chain a manual SCART switch off one of the gscartsw inputs. Put your least used consoles on the manual switch. +1. The gscartsw has always been 8 inputs. And SuperG's recent interview with RetroRGB makes me believe he wants to stop revisions on the gscartsw. Plus 8 is a power of 2. It just makes sense to stop there.